Just when we thought Donald Trump couldn’t sink any lower in his attempts to rescue his disintegrating campaign, he threatened to jail Hillary Clinton during the second presidential debate on Sunday. As always, the kids in the SheKnows #Hatch program don’t miss a trick. From calling out Trump for dismissing his sexual assault claims as “locker room talk” (“he’s saying, like, really offensive things”) to his remarkable ability to avoid the question (“he just keeps on changing the subject”), these kids know exactly where it’s at. The children’s reactions also prove “the Trump effect” Clinton talks about. “He just threatened [Clinton] in front of millions of people. If he becomes president, he can do much more than just threaten someone,” pointed out one kid. “As a Muslim person, I feel that Donald Trump is dangerous and just so scary,” said one young boy. The kids summed up what so many of us are thinking when we hear Trump call himself a gentleman: “I don’t know if he’s joking.” Basically the younger generation can see right through him, accusing him of “only pretending to have respect” for women and African-Americans and Latinos to earn their vote. 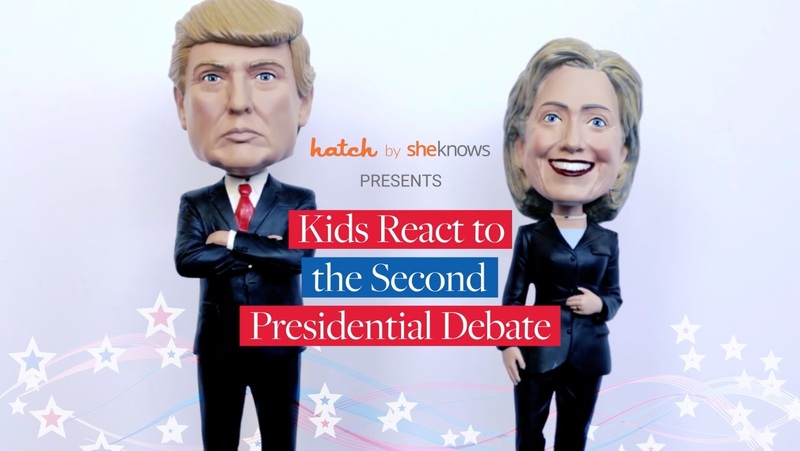 With two of the three presidential debates in the bag, it’s pretty clear that our #HatchKids’ minds are made up: Hillary Clinton all the way.